When it comes to taking care of my dog, I believe in using the best dog products available. Shampoos are not exceptional. It is always advisable to use the best dog shampoo when cleaning your dog. Ordinary laundry soap or human shampoos may do them more harm than good. It goes without saying that shampoo should serve its purpose effectively. If your dog suffers from skin problems, invest in a medicated shampoo. Similarly, for dogs with a hairy coat, invest in a detangling shampoo. Rarely will you find a shampoo that transition from a puppy to an adult dog. Reason being, most of adult dogs shampoos contain ingredients that would otherwise be harsh on a puppy. Ensure you always read the manufacturer’s age recommendation before you buy. For dogs that are let loose outside your compound, you should consider a shampoo with a deodorizing effect. If your dog hangs around your house all the time, this is not a necessity. Whatever the case, avoid strongly perfumed shampoos. They can affect your dog’s respiratory system and cause irritation. The best shampoos should always leave your dog’s skin moisturized after washing. This is also a good indicator that the shampoo is gentle on the skin. Therefore, such shampoo doesn’t strip off the dog’s natural oils. Mostly, go for shampoos that contain plant based oils such as coconut, Aloe Vera, and almond oils. For dogs with sensitive skin, you should avoid any shampoo containing paraben, chemical dyes, and artificial colors. These are guaranteed to react with your dog. Alternatively, stick to natural shampoos. They will cost a little more, but rarely will you suffer from allergies and other reactions. Extra ingredients such as Vitamin E, honey, and oatmeal work better with such dogs. Medicated shampoos should be used under a veterinary doctor’s advice, and they should be your last resort. This is a great on-budget shampoo. Despite the relatively low cost, it does not compromise on quality. If you are looking for a silky effect on your dog’s skin, this is your ideal choice. However, if you love deodorized dogs like I do, consider other options. The shampoo smell wears off immediately when the dog dries. The oils contained in OxGord Natural shampoo help in preventing your dog from itching. These include coconut oil, Aloe Vera, and jojoba oil. Because of these oils, OxGord Natural is a good choice if your dog has dry and itchy skin. The shampoo contains Rosemary Extract, Shea Butter, and Oatmeal, which when combined produces a great moisturizer. You will love the silky and smooth feel on your dog’s skin after the shower. This shampoo is tearless, which is highly recommended since your dog won’t close his or her eyes when bathing. The last thing you want is to irritate those eyes or cause them to sneeze after the shower. The shampoo is organic and free from Paraben. Therefore, chances of reacting with your dog’s skin are very rare. However, every dog is different. If you notice a reaction, please stop using the shampoo immediately. Finally, Oxgord natural shampoo comes in a very generous packing. The 75ml bottle is relatively tall. To make washing easy, the bottle has a small hole via which you squeeze the shampoo. Because of that, you only get the exact amount you require without wasting. The Pro Pet shampoo is made for both dogs and cats. It is designed to eliminate common skin allergies and flea bites. If you dogs suffer from sensitive and itchy skin, this is a good choice for you. However, if you love mild smelling shampoos, you might want to consider a different brand. The scent is lovely, but more on the stronger side. The shampoo lathers gently and is safe for daily use. I love the fact that it makes hair brushing painless for the dog. In addition, it doesn’t irritate the dog’s nose or eyes. The products used are mild and manageable even for the most sensitive dog. The shampoo is Anti-pruritic- the oatmeal granules are fine enough to absorb the allergens. In addition, it doesn’t contain parabens & alcohol which makes it a good choice for sensitive skin. It is enriched with vitamins A, D, and E for the perfectly smooth and silky skin. This shampoo is very economical. It is one of the few shampoos you only need to squeeze a few drops for each bath. That is what I call great value for money. Good dog shampoo also eliminates the need for a dog deodorizer- which the Pro Pet shampoo does. Its lovely smell will last your dog a whole day. The SynergyLabs shampoo is a medicated shampoo that combats most of the common dog skin conditions. It is safe to use and doesn’t irritate the dog’s nose and eyes. This shampoo will be your best shampoo for dogs that suffer from flea infestation, bacterial, fungal, parasitic, and yeast skin infections. Examples of such conditions include; Mange, Seborrhea Dermatitis, inflammation, scaling, and rashes. However, if you are looking for a lovely scented shampoo, SynergyLabs shampoo is quite the opposite. The shampoo does not contain Paraben, alcohol, dye, or soap. Therefore, it leaves the dog’s skin well moisturized. In addition, you will find that very few dogs will react to the shampoo. But like I mentioned before, if your dog is among the few, discontinue use immediately. SynergyLabs medicated shampoo contains Allantoin and Colloidal Oatmeal. These two ingredients are best for skin hydration. They also promote skin healing in cases of severe parasitic infections. Finally, being a medicated shampoo, you need not use it regularly. In a week, 2-3 times will be sufficient. When your dog improves, you can reduce to once a week. On the other days, you can bath them with non-medicated shampoos. The FURminator shampoo is formulated for hairy dogs. It is meant to reduce the amount of fur shed. Consequently, your dog enjoys a healthy skin as well as a healthy coat. Does your dog shed hair excessively? If yes, then FURminator shampoo is your ideal choice. However, an alternative brand would be better if your dogs are not hairy. Unlike traditional shampoos, FURminator shampoo is formulated with ingredients to help you brush your dog effectively after bathing. The first times of use, you will need extra brushing. But as you continue using for a couple of weeks or so, the amount of hair on your brush will reduce significantly. However, the shampoo should never replace your grooming brush. It only helps with lifting off dead hairs for the brush to reach them more effectively. The FURminator shampoo has a lovely scent. You will not require additional deodorizers. The smell is neither strong nor weak. The manufacturers found the perfect balance with this shampoo. The shampoo also leaves your dog looking trimmed. I am not sure if this is the after effect of the shampoo or it’s as a result of excessive brushing. The shampoo doesn’t contain chemical dyes or paraben. Because of this, it is very gentle on your dog and less reactive. Additional oils from papaya leaf extract and Calendula extract, as well as the fatty acids, help with moisturizing the skin. Omega 3 and 6 promote a healthy skin and coat. The Pet Care professional grade shampoo is a five in one cleanser. It cleanses, conditions, detangles, deodorizes, and moisturizes your dog. This will be your dog shampoo if you prefer investing in a single product for all the above uses. However, if your dog suffers from frequent skin problems, a medicated shampoo would be your ideal choice. Coconut and palm oils are excellent conditioners. As a result, this shampoo is a great moisturizer and conditioner for your dog’s skin. If your dog suffers from dry skin, you will notice a shiny and silky skin after-effect from continuous use. I love the smell of this shampoo. It is mild yet lasts for a long time even after your dog dries. The shampoo is free from harmful chemicals. Consequently, it is gentle on your dog’s skin and will have minimal reaction with most dogs. Out of the five in one feature, this shampoo does a pretty good job at cleansing, conditioning and moisturizing. However, for very hairy dogs, you will notice that the detangling job is not as effective. To achieve painless brushing on your dogs, use a separate detangling product after washing. This shouldn’t bother you if your dog has minimal hair, though. Oh, I did forget to mention that the moisturizing effect is also achieved very well with this shampoo. From the above, it’s clear that the list is endless. However, your choice of shampoo for your dog will either add value or deteriorate your dog’s skin condition. I always advise dog owners to stick to the basics. If your dog is suffering from skin illnesses, use a medicated shampoo. If your dog is a hairy breed, use a detangling shampoo. 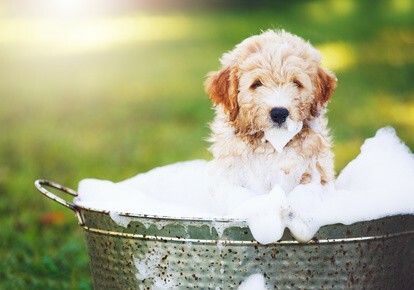 As a result, your dogs will enjoy their bath time, and you will have less stress and struggle when bathing them. Finally, the best dog shampoo doesn’t necessarily mean you pay an arm and a leg. The products above cost so little, yet they stand out from the rest of the market today.